When THIRD RAIL broke up in October 2000 Adam and James decided to start a new band, had a few practices at Yellow Arch, wrote some new songs and named themselves after an industrial building they saw on the way to a practice. In January 2001 they asked Ralph to play bass and johnnie to play synth and guitar, but as the synth didn't really fit it was soon dropped. They practiced and wrote more songs, but after one gig at the Grapes in July 2001 they split up. In September 2001 Adam, James and johnnie decided to record the songs to proove that the band had really existed. While recording the backing tracks for what eventually became the disconnected ep at Yellow Arch they were asked to play at Barfly Sheffield a couple of days later. Although time has clouded memory it is thought that jcac played the night before the official opening night of the venue at what had been the National Centre for Popular Music in October 2001. Although no-one was there to see them the band thought that the gig went well and so decided to continue as a bassless three piece with johnnie using a sub-octave fuzz pedal to make bass-like noises on the quieter parts of their songs. They played again as a three piece at the Grapes in November 2001 after which they took a break for xmas which lasted six months. In the spring of 2002 they asked Craig from Betty's Clinic to join on bass and that gave them the motivation to finish their first ep disconnected before the first practice with Craig. During the disconnected sessions they had also recorded a rocky version of the ELEVATOR TO HELL song "my head" for an ELEVATOR tribute album. 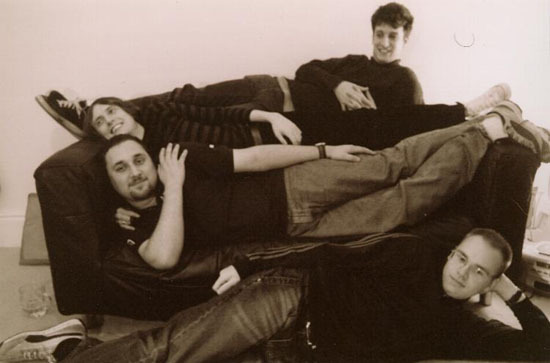 After Craig joined they practiced, wrote new songs and recorded their second ep The Attic Tapes in September 2002 and at the end of the same month they started work on their first album. Sadly, Craig left to go to work on a boat before the album was finished and so jc albyn complex became a three-piece again. In typical jc albyn complex style they did nothing as a band for a year. In early 2003 Adam started recording a solo project called yell and the nolls and with the help of two "session musicians" (johnnie and Alice from the sPrinG). They recorded an eight song mini-album in three days spread out over six months. Eventually jc albyn complex decided to start again. After a few practices they decided to dump the old recordings and started recording the backing tracks again in 2004. They practiced occasionally and added some overdubs to the recordings, but one morning Adam woke up and found that his left arm wouldn't move. This was a big problem for him as he is left handed. Although he plays guitar right handed, his limp left arm made guitar playing impossible so jcac had another break.... After about six months Adam's arm started working again and Craig returned from the boat soon after. A year later after frequently talking about having a practice a bloke called Dave (who had just started learning guitar) gave jcac the energy required to phone and book a practice. As James was not available johnnie and Craig alternated drum and bass duties and Adam and Dave played guitars. The practice demonstrated that jcac needed someone who could play drums to play the drums. Luckily James was available for subsequent practices so a five piece jc albyn complex started practicing and wrote some more new songs. The five piece jcac planned to record a new album over the Easter weekend in 2007, but Dave decided not to join in. Adam, Craig, James and johnnie recorded the backing tracks in a day, but left them to be finished at a later date (always a bad mistake at sPookY sounds). As the recordings were still not finished a year later a plan was hatched to finish them over Easter 2008, but the plan feel apart so johnnie found the master tapes of the 2004-6 recordings and mixed them as "The Lost Tape" instead. About six months later johnnie got talking to Leon from The Silent Age and SkyEdge. Years earlier Leon had been in a band called Sanctuary that Third Rail had been about to do a gig with, but split up just before the gig. Leon asked jc albyn complex to play with SkyEdge at the Grapes on 25th October 2008 and so jcac played their first gig for seven years and finally finished the album "the resurrection of..." so that they could give copies away at the gig. jc albyn complex played a few more gigs over the following year and started to record a new album in August 2009, but unfortunately at a party after a Halloween gig at the Grapes on 31st October 2009 James broke his ankle and so jcac used that as an excuse to have another few months doing nothing. jcac moved to their own studio space at Stag Works in Spring 2010 and completed "the persecution of..." in November that year. During the Autumn of 2010 jcac started writing new songs and decided to start recording their next album in December. The plan was to do the album quickly, but as always the plan did not come together... Early in 2011 Black International (a band from Scotland) set up a tour to promote their new album and jcac and The Death Rays of Ardilla supported them at West Street Live on 16th March. jcac played again at The Green Room in April 2010 supporting The Silent Age at their album release party. Recording was put on hold while the band practiced for the gigs, but started again intermittently over the next year or so and the album "the crucifixion of..." was completed in May 2012. In June 2012 jc albyn complex moved to a new practice/recording studio and had their first practice for over a year. They practiced infrequently and started writing new songs and played another successful gig in July 2014, but have not practiced since.